Corjae & Black Machine are btohers. A Diabolico II dive goes very badly, and he passes away a few days after this show. 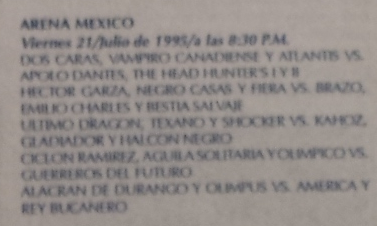 5) Rayo de Jalisco Jr., Silver King, Vampiro Casanova vs Head Hunter I, Head Hunter II, Miguel Perez Jr.
2) Tortuguillo Karateka I & Tortuguillo Karateka II vs Kundra & Pirata Morgan Jr.
3) El Hijo del Solitario, Kato Kung Lee, Kato Kung Lee Jr. vs Arkángel de la Muerte, Kung Fu, Kung Fu Jr.
2) Cerebro & King Xadow DQ America II & Ultraman Jr.
4) Dos Caras, El Fantasma, Solar I vs Mogur, Scorpió, Scorpió Jr.
5) Atlantis vs Dr. Wagner Jr.